When the King of England, William IV, died in 1837, his niece Victoria became queen of England. She was also the queen of many other countries. But she was only 18 years old. Like the kings before her in England, Victoria didn’t really have much power. Her Prime Ministers and Parliament mostly ran the country. And even though Victoria tried to get power, she actually had less and less power as time went on. But the government continued the same colonialist policies. In 1839, for example, Victoria’s prime minister Lord Melbourne attacked China to force China to trade with Britain. In 1845, the first major crisis of Victoria’s reign hit. That was the Irish Potato Famine. Victoria’s government let rich people in Ireland keep on selling food to England, even though millions of Irish farmers were starving to death. Many Irish people gave up and left for the United States. In 1860, the British had to decide what to do about the American Civil War. Most British people were against slavery, so they were on the Northern side. But rich people in Britain really wanted the cotton the slaves grew, to make cloth to sell and get rich. Britain stayed neutral, but rich British people secretly helped the South. Britain also relied on cotton from British colonies in Africa and India. After the Civil War, as African-American men got the vote in the United States, Britain also let more men vote through the Reform Act of 1867. The British government spent a lot of time on diplomacy. They tried to manage other countries around the world in the ways that would be best for rich people in Britain, though not necessarily for the poor, or for the other countries. One big concern was keeping control of India and its cotton. The British prime ministers worried that if the Ottoman Empire, Russia, or China got too powerful, they would push the British out of India. So the British tried to weaken those countries. In the 1880s, Britain took control of Egypt and Sudan away from the Ottomans. In 1876, as the Uighurs tried to get their independence from China, Britain worried that Uighur independence would make Russia too strong. Maybe Russia would attack British India. So Britain sent a lot of money to the Empress Cixi in China to help her fight the Uighurs and force them to stay part of China (and they are still part of China today). But at the same time, the British started the Opium Wars in China. The British sold opium to Chinese people, to weaken China. And Britain fought the Crimean War against Russia. In 1885, the British took control of Botswana. Other countries got poorer, and rich people in Britain became very, very rich. At the same time, though, ordinary British people were starting to see voting as a right for all people. 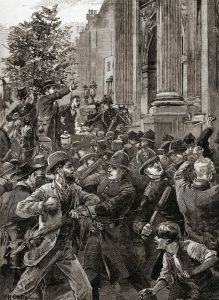 Thanks to public protests, by 1885 most men in Britain could vote. 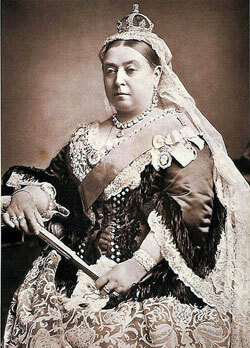 When Victoria died in 1901, after ruling for 63 years, the British Empire was very strong. But British women were still fighting to get the vote, along with the poorest British men. Cite this page: Carr, K.E. Victorian England – British History. Quatr.us Study Guides, August 6, 2017. Web. April 26, 2019.